Julian Rachlin, one of the world’s most renowned violinists, will grace the Northern Lights Festival de Febrero in Ajijc, which opens its 14th season on Saturday, February 20 and runs through March 5. Festival founder and artistic director Christopher Wilshere ranks Rachlin in “the same echelon” as Chinese-American cellist Yo-Yo Ma, Israeli-American violinist Itzhak Perlman and the celebrated U.S. violinist Joshua Bell. “As much Joshua Bell is a household name in North America, so is Rachlin in Europe,” Wilshere says. Born in Lithuania in 1974, Rachlin emigrated to Vienna in 1978. He started playing the violin when he was two and a half years old. 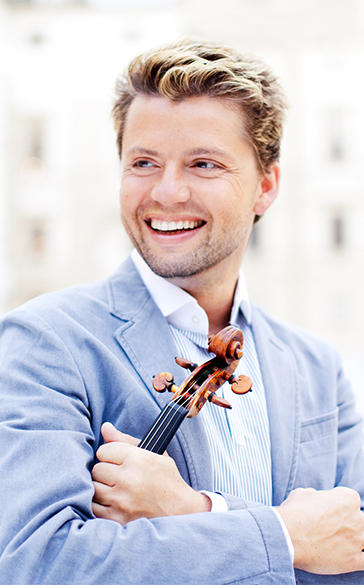 At age 14, he became the youngest soloist ever to play with the Vienna Philharmonic. As a mature performer, and under the tutelage of Pinchas Zukerman, he added the viola to his performing instruments. He has since also become an acclaimed conductor. Rachlin’s has performed with the world’s most preeminent orchestras and under the baton of many illustrious international conductors. He has also recorded for prestigious labels such as Sony Classics, Warner Classics and Deutsche Grammophon. Some reviews of recent performances give us a clue as to Rachlin’s immense on-stage presence. Yet off the stage, Wilshere describes Rachlin as “a very human person, cool, down to earth, with very little ego.” He also mentions the violinist’s love of Mexico and tequila! Rachlin has been a UNICEF Goodwill Ambassador since 2010, dedicated to the education of the next generation of classical music lovers. He takes great joy in sharing with his students every possible tool that could help them in their artistic and human development. His philosophy is that every established musician has a responsibility to ensure the continuity and love for classical music. Lakeside audiences will see and hear Rachlin as the featured soloist in a twin bill of two versions of “The Four Seasons” on Wednesday, March 2, 4 p.m., at the Auditorio de la Ribera. The first is the most famous and best known and loved, by Antonio Vivaldi. The second is by the Argentinian tango composer, Astor Piazzolla. Inspired by Piazzolla’s love of the tango, and featuring sometimes curious, often fun, tonalities and investigations into the range of possibilities of the violin, at some point each movement for each season harkens back directly to Vivaldi’s original melodies. And Lakeside audience will be able to hear all of this played on one of the greatest violins in the world, a 1704 Stradivarius, built when Vivaldi was only 26 years old.